Anthem is BioWare’s take on live game development, which means continued updates after the game launches. Today, the studio has revealed the roadmap for the first set of updates, including what to expect immediately after launch as well as some hints on what’s coming a bit further down the line. After the Anthem release date on February 22, we’ll see the first ‘act’ of post-launch content begin in March, though BioWare doesn’t specify exactly how long each act will last. The first big release is titled Echoes of Reality, and this act will be divided into three major updates: Evolving World, Stronger Together, and the Cataclysm. The latter seems to be related to the storm which appeared toward the end of the Anthem demo. BioWare describes Cataclysms as time-limited world events, featuring dangerous weather and new enemies alongside bits of fresh story to uncover. In addition to the Cataclysm, act one will bring us new events, quality of life updates, new rewards, an expanded progression system, a new Stronghold, guilds and leaderboards, and new missions. Presumably further acts will bring us similar volumes of new content. The official site teases acts two and three with a small image for each, but no titles or dates for either. The video above provides some additional context on the endgame, and a few glimpses of what to expect from Cataclysms. 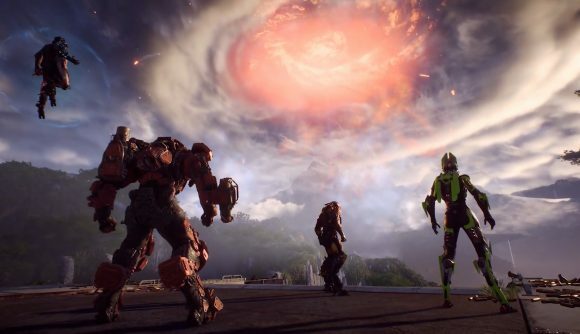 EA’s got big sales expectations for Anthem at launch, but the game’s long-term prospects will be much more dependent on this kind of continued support to keep players interested over the long haul.